under this Creative Commons Licence. Originally there were seven (we think), then six, five and, inevitably, four. Then five again. And they are now known as ‘Duddo Five Stones’ – Northumberland’s equivalent of the mighty Stonehenge, you might say. As has often been remarked, the ancient monument is one of Britain’s finest and enjoys a spectacular setting. The Cheviot and Eildon Hills loom to the south-west and west, respectively, with the stones themselves enjoying an elevated and isolated position to the north-west of the village after which they are named. Until recently, no one knew quite how old the little stone circle is. It is a modest affair at around ten yards across with none of its components more than eight feet in height, and early speculation suggested a Druidical origin. In time, the locals assumed it to be a memorial laid down after a victory over the Scots in 1558 in which the Percies chased off a party of plundering invaders. Quite where and why this tradition arose no one knows, for the truth is that the landmark is, indeed, ancient, with investigations in 1890 revealing remnants of a cremation burial. In 2008, an archaeological dig at the site unearthed charcoal remains which were radiocarbon dated to around 2000BC. Furthermore, faint traces of man-made cup-and-ring marks have been found carved on the large east facing stone which seem to confirm its Bronze Age origins. There were at least seven stones to begin with, six surviving into the nineteenth century. Two more seem to have disappeared or toppled over during the ensuing decades, after which they became known as the ‘Four Stones’. Then, in 1903, a fifth was re-erected to ‘improve the skyline’. The Duddo Standing Stones are certainly a curious lot. 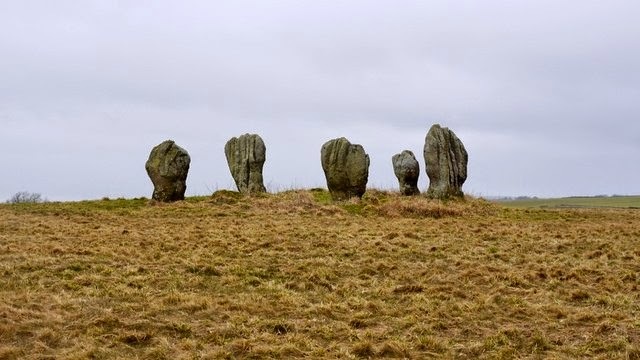 They have been known in the past as ‘The Ladies’ (due to their tapering shape) and ‘The Singing Stones’ (perhaps a reference to the wind whistling through their weathered grooves). And, once more, they can be easily and freely visited by the casual passer-by.